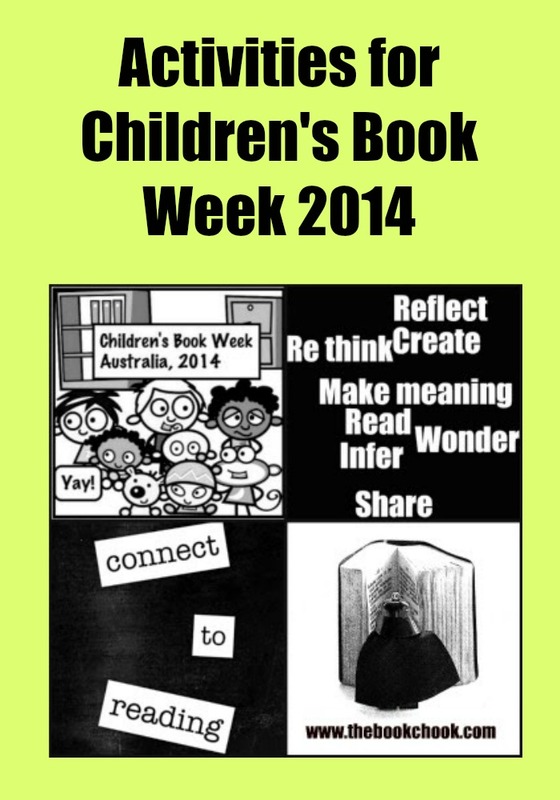 Children’s Book Week in Australia runs from Saturday 16 August - Friday 22 August in 2014. (If you're looking for my Children's Book Week Activities for 2015, you'll find them here.) To give teachers, librarians, parents and kids plenty of time to prepare for this wonderful celebration of reading, I’m sharing some ideas here today. Over at my Fun with Learning blog, I describe some free PDFs I've made to share with you: Mystery Titles, Name that Book, and Connect to Reading. I hope they'll be useful. 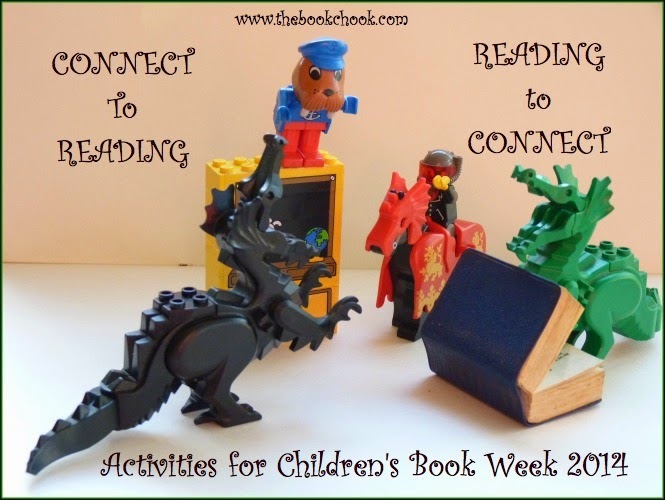 The theme for Children’s Book Week this year is: Connect to Reading. Isn’t that a fantastic theme! On a basic level, we want kids to connect by simply participating in the act of reading - whether that reading be a short-listed book, a magazine article about football heroes or a sign saying Wet Paint. We want them to understand the prevalence of reading in their lives, and how important it is to both enjoy reading and develop reading skills. Delving deeper, we encourage children to MAKE connections between what they read, and other things they think, feel, know of. We encourage them to identify connections between what they read and their own lives. We hope they’ll embrace reading and connect books to other activities, other people’s stories, other media. Kids are social beings - encouraging them to share books with their friends and others is a wonderful way to help them love reading. After all, connection is a basic human need. We all want to connect - with each other, with our families and friends, with other parts of our own experience. Helping kids connect to reading is vital. By connecting what they read to their own experiences, to other books and media, and to what they know of the real world, children can enter further into literature and enrich their own lives. 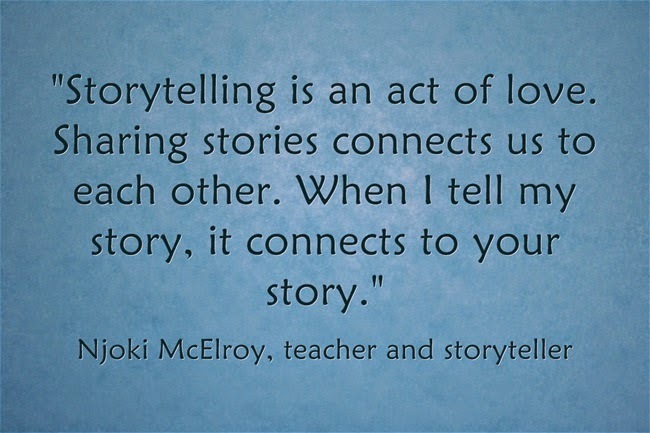 Connections help kids become part of a story and understand characters’ motivations. By taking time to reflect on connections, children move beyond the superficial to gain some awareness of theme and the author’s purpose. When they really connect to reading, kids begin to understand and appreciate. With encouragement, they begin to analyse and respond to literature, and go on to create literature of their own. Connecting with and responding to literature is found in every grade level in the Australian English Curriculum. And it's fun! Helping our kids make connections to reading is one of the ways we can help them enjoy reading and develop their reading skills. Does your child have access to a range of reading material? Consider things like getting him his own library card, giving him special pocket money for buying books he likes, helping her find print books or e-books online that interest her, encouraging her to swap books with friends, and sharing regular read-alouds at home. Once your child has access to lots of books, help him become a stronger reader by encouraging him to make connections with the content of what he reads. You might remind him of a similar book you’ve read together, revisit the story about Grandpa and the fish that got away, or recall a time when he felt the same way a character felt. Another simple way to do this is to ask questions. Working out effects and causes like this is useful in helping children focus on thinking about what they’ve read, and helps develop reading comprehension. Discussion: It's a fundamental human need to connect with each other. What ways do we do this? Books can help us feel connected. We "walk a mile" in a character's shoes and gain some understanding of what it's like to be someone else. What books have kids read where they made "connections"? Does anything they have read remind them of something that happened in their own lives, or something they saw or heard sometime? How can we help our friends connect to reading? Discussion: What other kinds of reading besides in books can helps us make connections? For instance, we read newspapers to connect with others from across the world and what's happening where they live. We read bus timetables to connect with our future destinations. We read letters to connect with friends and relatives. We read magazines to connect with our interests and hobbies. Activity: Create a comic based on the theme: Connect to Reading. The two below were made with iPad app, ToonToolKit. 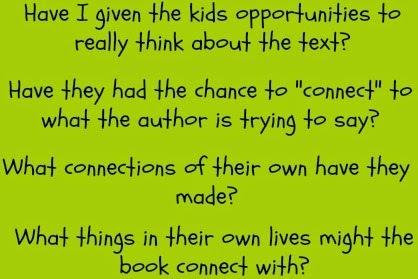 In what ways could we show others how we connect to reading? Video? Art? Performance? Photography? Presentation? Ask students to set up a photo with the theme Connect to Reading. Print them out and use them for a display. Have a caption contest to bring kids into the library. Find some great quirky photos and have students nominate what the person, animal, signboard is saying. Bonus points for anyone who can prove there is a connection to reading in their caption. Run a guessing game in the classroom or library. You’ll find several fun Literacy-Based and Other Guessing Games at The Book Chook. Quick writing: lists. As a group, brainstorm a list of all the different kinds of things we read in our lives, from bus timetable to street sign to song lyrics to movie credits to lolly prices to books. What do we enjoy reading? What do we not enjoy? List all the books we love. List the books we want to read in the future. List our favourite characters in books. What other lists can kids think of connected with reading? Challenge: 10 second plot summaries. Have kids make a presentation of some sort lasting exactly 10 seconds, but summarising the plot of their chosen short-listed book. Consider using: oral presentation, oral presentation with classmates making still pictures with their bodies, video, slideshow of photos with voiceover, static drawing with appended short summary that would take about 10 seconds to read. This is a short achievable project with lots of thinking skills involved, and would make an excellent display for Children's Book Week. Are there any celebrities in your area? Children’s Book Week is a great time to bring in sporting stars, singers etc and ask them what connects them to reading, what reading means to them, to share a favourite book etc. Authors and illustrators are celebrities too! Who better to help kids connect with their favourite books than a beloved author or illustrator? Creative Net has authors available in each Australian state and they don’t charge a booking fee. 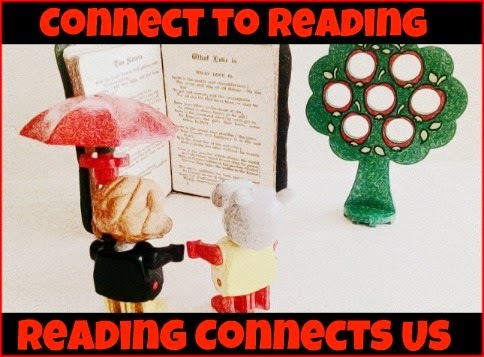 How can reading connect us? Do a book study with another school. Consider using Skype to connect with a school in another country. Have older kids read to younger ones one of the books they loved as a child, then talk over the book together. Connect to other kids all over NSW by joining in with the KOALA Awards - Kids Own Australian Literature Awards. By voting in their own literature awards, children can indicate the books that they think deserve recognition. If you live in Victoria, check out the YABBA Awards. Make connections within your own school, by setting up local class, school or library awards. Help older kids make geographical connections to the real world or to a fictional world by using Animaps. Connect to spatial intelligence. Have kids choose a scene from a book they’ve read to portray in LEGO. Younger kids could simply work out a LEGO scene that has a connections with reading. Another great classroom or library display! Connect reading to video. Have a school-wide video book-talking or book trailer contest. Connect reading to food. Have an edible book display. Students could choose to transform fruit or vegetables into book characters or decorate a cake to illustrate a particular children’s book. Connect reading to art. Have a class look closely at an illustrator’s style and see if that style suggests some art work of their own. Connect art and writing to reading. Have kids create a poem about themselves for others to read on a vibrantly coloured piece of art. Here’s a lesson plan. Crossword puzzles: Have kids choose vocabulary from a short-listed book and work out clues to make a digital and printable crossword puzzle for a partner to try. Younger kids can try a junior version here. With older students, take a look at the project 7 Billion Others: “Forty-five questions that help us to find out what separates and what unites us … The heart of the project, which is to show everything that unites us, links us and differentiates us, is found in the films which include the topics discussed during these thousands of hours of interviews.” Encourage kids to reflect on what connects us as humans, and present their thoughts and ideas via multimedia. Remember, reading is not just about traditional print books. You might like to read: Reading - It’s Not Just Books. Connect to your friends. What books do they like? Do they read print books, e-books, comics, magazines, road signs - what? Have you read any of the same books as your friends? List all the kinds of reading you do, then find three people in your class who like the same kinds of reading as you. Connect to your family. What books did your mum/dad/grandma/grandpa/aunty/uncle like to read when they were young? Find one of these books and read it. What sort of reading do relatives do now? What is one of your cousin’s favourite books? What books have you read that you can recommend to other people in your family? Write a one sentence description for each book. Connect at school. List one favourite book for each teacher at your school. Find a younger student and tell them about one of the books you loved when you were their age. Connect to let others read you, or learn about your reading. You might use Skype, phone, text message, an app like Haiku Deck, a comic format, a class newspaper, sticky notes, a sign, a wall display, a message in a bottle, an original song, or a video. Connect a fiction book to a non-fiction book. What is the connection for you? Consider drawing, writing, sculpting or painting about the connection. Consider creating a dance, designing a diorama, making a movie, or making a model about the connection. Think of a character in a book that you had a connection with. 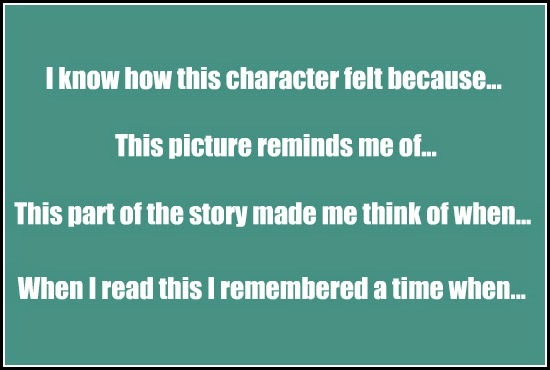 What made you feel connected to that character? Using recycled materials, show yourself, the character and the connection between you. Plan, draft and publish a comic with photos of yourself and your friends acting out important scenes from your favourite fiction book. You could use software like Comic Life, or if you have iPad, an app like Strip Designer. Consider using an image filter like Halftone, ComicBook or Paper Camera to give your images the comic “look”. Poster - set up and photograph a scene/portrait that means Connect to Reading to you. One way to do this might be to brainstorm all the different ways reading connects us to the world, to other people, to fun, to learning etc. Or you could imagine what a VERY connected person might look like. How can you portray their connectedness in a photograph? What toys/models/props can you use to help present your ideas? Once you have a photo you're happy with, consider how to use it in a poster. Will you make a digital poster, printed poster or both? Who will the audience for your poster(s) be? Extend the idea above and make a short video instead. List all the games you can think of about making connections. e.g. Connect 4, anagrams where you link letters, jigsaw puzzles, LEGO, Cluedo, sudoku, crosswords. Read the directions for one game, then re-write the directions for a younger child. Consider adding sketches or photos. Choose the book you believe should receive Australia’s highest literary award. Why did you choose that book? Create an advertisement that persuades others your book choice should win the award. Choose one of the short-listed picture books you like. Create your own picture book using ideas or features that piggyback on that author’s. Choose a setting from a book you know well and create a travel brochure inviting tourists to visit it. Don’t forget to explain what the benefits of such a visit might be. Make a connection by comparing and contrasting two books or characters or themes. Give examples to support your points. Create a collage based on some of the events, characters and scenes in one of the short-listed books. Don’t mention the book’s title. Can your friends work out which book your collage represents? Create a trading card based on a character from literature. If you have an iPad, try Read Write Think’s Trading Card for a digital version. Or try the online version. Write a short play for younger children based on a scene from a book you liked reading. Don’t forget to choose language that’s appropriate for a younger audience. Find, draw or photograph images that connect you emotionally to a book you’ve read. Use Power Point or a presentation app like Haiku Deck to add words that explain your connection to each image. Add music and sound effects in iMovie, Movie Maker or a website like PhotoPeach. Consider using other different apps to refine your presentation until it gets the message you want across to your audience. What kind of reading superhero are you? From A Book and a Hug, here’s a quiz that helps you discover your reading personality. If you had to portray yourself as a reading superhero, how would you do it? 1. Brainstorm all the different ways you can think of to connect things. 2. Choose a favourite book you’ve read that you have some kind of connection to. 3. Pick one or more connectors that you brainstormed in 1. and design something suggested by the book in 2. 4. Make a model of what you designed in 3. Say one of your favourite books is The Hunger Games. You might decide to create a bow and arrow because you once had one when younger. You read about bow and arrow construction, then sketch out some ideas. You try out different materials, using strong glue to connect feathers and sticks for arrows. Perhaps you love the Violet Mackerel books. Partly that’s because you love making small things just like Violet. You decide to invent a tiny doll’s house and use connectors like glue, split pins, staples and velcro to create furniture for a tiny doll. Maybe you choose Silver Buttons as your favourite book. You wonder what it was like the day you took your own first step. You wonder if anyone in your family knows anything about your or others’ first steps. You decide to use phone, Skype and text messages to ask your relatives about different babies’ firsts steps. You design a little book with illustrations and captions showing some family first steps. If you love to read and learn about making, explore the MAKE site, which has DIY projects, how-tos, and inspiration from other makers. Squiggles - One student draws a squiggle or random line and another joins in by connecting onto that squiggle and making something new. Chinese Whispers - Students pass a whispered message along a line and the last person says it aloud. Directions. Human Knots - Small groups tangle themselves and have to work out how to get untangled. Directions. Word Association - This is a very simple game where a child thinks of a word, and her partner supplies a word she associates with it. It’s fun/interesting for children to work out the connections between the words. Forced Connections - Have a lucky dip or grab bag of ideas. Students draw two or three and must work out how to use them together in some way. This can be done with art, in writing a story, in a dramatic improvisation, or in designing almost anything. For instance, children work in groups of four or five to improvise a scene including these three characters: a goldfish, a window washer and a poet. Or they can design a solution to too much classroom noise with a chair, a trampoline and a lawn mower. Memory/Concentration - Kids could make two cards each, based on selected characters from literature. Combine the cards into a class pack for playing Concentration.